At Neurocrine Biosciences – voted one of San Diego’s top places to work in 2018 – we pride ourselves on having a strong, distinctive and positive culture based on our shared purpose and values. We know what it takes to be great, and we are as passionate about our people as we are about our purpose – to relieve patient suffering and enhance lives. WHAT WE DO: Neurocrine Biosciences is a biopharmaceutical company focused on developing treatments for neurological and endocrine related disorders. 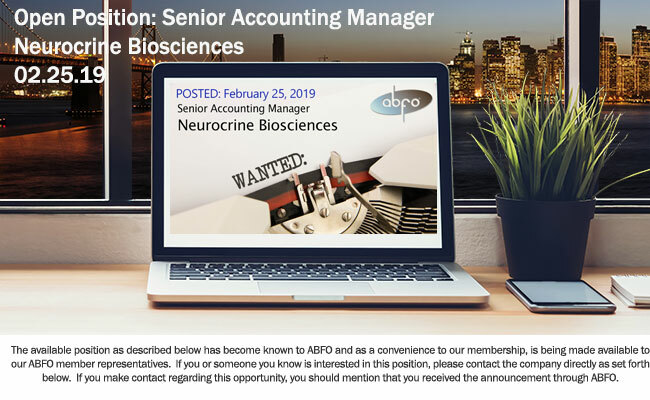 ABOUT THE ROLE: The Senior Accounting Manager will lead all day-to-day operations of the accounting department while ensuring compliance with GAAP and other applicable standards, rules and regulations.